It never fails, someone at least once a day asks me about my jewelry and wants to know about it. So I thought I would share it with you guys also! I am very into jewelry and accessorizing, aka I pile on jewelry at all times. Even if I am wearing black leggings and a white tee, I will have stacks and stacks of jewelry on, its my thing. I make my own bracelets and make them for my friends. I used to sell them in college, I am thinking about resurrecting my jewelry line. Right Hand: My own Bracelet es, Cat Bird Snake Ring worn on first knuckle, Cartier Love Ring in Rose Gold. Left Hand: One of my own bracelets, skull bone bracelet by evolution, sterling silver double band ring by made her think. Love the ring in the 2nd pic and the Cat Bird Snake ring. thanks for stopping by my blog! and im glad to see yours! i really like it, ill add you cuz id love to follow your stuff! thank you! Hi Pinkapple- Thanks for stopping by!!! Nikyta- I love stacking it on!!!! You should go for it! i loveee the purple nail polish, which reminds me i have to get some! Cute bracelets. =) I love to wear accessories to spice up an outfit. HI Elizabeth Marie- Thanks for coming by! I am relatively new to the blogging scene! glad you are here now! Silvie- Thanks! It is INK by OPI! I am cooking up something new now !! Krasey- You are welcome, glad you enjoyed it! WOW you should definately start selling those bracelets,v house of harlow. 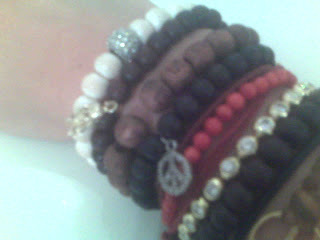 loveee your bracletes, i always pileee on wooden bracelets like those! in love ..
you should start selling your bracelets you make on your blog!